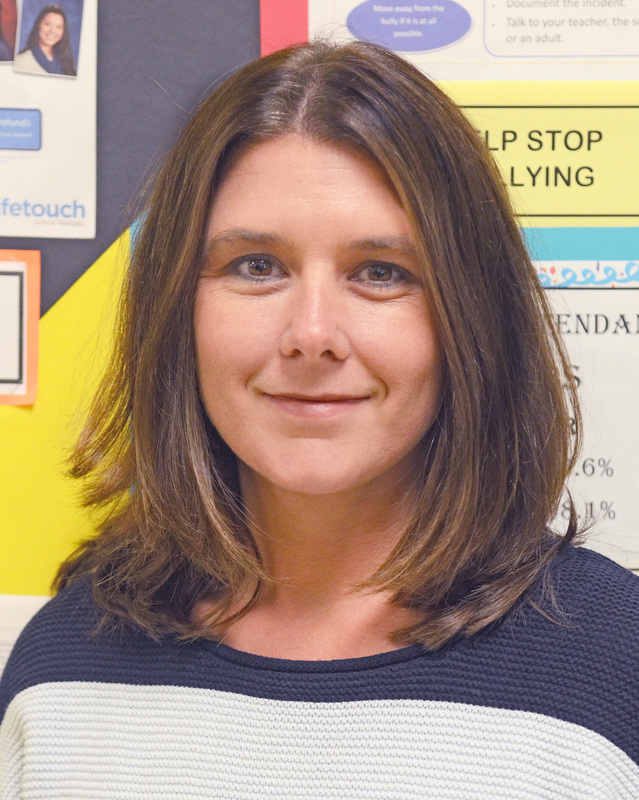 Kristen Goldstraw is a mom of three BCPS students. Her oldest son attends Eastern Tech as a freshman this year, her youngest son is a third grader at Martin Blvd Elementary, and her middle son is a 6th grader at Stemmers Run Middle School. Kristen is a dedicated member of the PTA in all three schools and serves as the PTA President at the elementary school. Additionally, Kristen has the pleasure of working in a BCPS Lighthouse Elementary School. When she is not planning fun family and school events, she volunteers her time with Boys Scouts of America and various sports programs as team mom or coach. She is pretty tech savvy and excited to see the Lighthouse process in middle school. During third quarter the students at Stemmers have had a chance to work on the devices to not only complete in school assignments, tests, and homework, they have also started to create presentations similar to PowerPoint and Movie Makers to expand the way they show their understanding of the content, while enjoying the process of learning new skills needed to work in the programs required to create the work. Both my middle school son and high school son are taking Spanish 1, so often the work is similar. The boys each had a similar assignment to create a family tree over the same time frame. While my high school son had to complete his on a poster which requires great efforts to put together a well-organized visually appealing presentation for some students, my middle son did a “Prezi”. This was similar to a PowerPoint presentation that looked like a tree. Due to the portable nature of the 1:1 device, he was able to work on the project from any location, such as in school during times that he had completed other work, at home, or on the way to a practice. While my older son was limited to working on it only while he was at home. This is a great example of how amazing this initiative is. While we continue to add responsibilities, activities. and opportunities to our students both in and out of the classroom, the devices allow the students to work from anywhere. My student really enjoyed collaborating with others in his World Cultures class when they were given options on how to present the regions of China. Options included a poster, report, make a movie, as well as a few others. I have to admit that I felt that was a tall order for a group of 4 boys to make a movie. I was concerned they had taken on more than they could handle, but they got right to work and created their project turning it in on time. The teachers are continuing to reach out to students and parents through the message option of BCPS One to ensure that everyone knows when grades close, or if an assignment can be redone. I think my son is continuing to find success in each class using the device. I had previously mentioned that I had hoped that Science would use the devices more with less paper, and I do think that changeover is starting. I can’t wait to watch this program and the students continue to develop in the years to come. During the last few months, I have noticed that my son and his friends have been able to work in ways I never imagined when I was in school. During my visit in November to Stemmers Run Middle for American Education Week, I was able to see firsthand students working with the 1:1 devices in Spanish completing a test, in ELA completing word of the week and collaborating over a book they had been reading in class, and in Science to complete an exit ticket. I watched as they completed the work and immediately pushed it back to the teachers using the turn in features of BCPS One. Often times, students knew immediately how they had scored and wanted to try again for a better grade or asking for information to help better understand the work for the future. I had hoped to see more use of the devices in classes like Science, where many times notes or assignments are on paper and glued into composition notebooks. Perhaps this will change as the year moves along. Since the students at Stemmers Run regularly carry the devices to and from school they have the opportunity to complete work such as homework or incomplete classwork from anywhere they have an Internet connection. I can imagine this has been a great equalizer for those students who may need additional time to complete work and truly show their understanding of the material. I know my son has taken great pride and responsibility in his work and grades. The teachers communicate effectively through BCPS One’s message system to both students and parents so everyone is fully aware of the expectations of assignment completion. My son is a student who previously struggled to meet his own expectations, but now that he has the opportunity to collaborate and take ownership in his own education he is excelling and taking risks he may not have taken before. I truly attribute this to the 1:1 S.T.A.T. initiative. Although he has moments where he become frustrated with his device overall it has been positive. As a parent of boys who enjoy technology already, I am very excited to see the process of using it at the middle school level. I think the process is off to a great start! At the beginning of the year, parents and students were given a brief meeting that answered a wide range of questions right away. The students seemed excited to get the opportunity to use the devices. Since getting the devices, I have spoken to many parents who seem amazed that their children have so many choices and opportunities to engage with each other. There is a sense of pride and ownership in what the students are learning. I have personally seen a love of learning sparked in my son since starting this process. I certainly think it has helped my son to stay more organized and complete work in an effective and efficient manner. I am looking forward to spending time in the classrooms during American Education Week coming up soon to see more.